NEW YORK (WABC) -- New York Gov. Andrew Cuomo and New York City Mayor Bill de Blasio criticized Thursday's Supreme Court decision on President Obama's immigration plan. The high court deadlocked 4-4 on the president's plan that sought to shield millions living in the U.S. illegally from deportation, effectively killing the plan for the rest of his presidency. "Today's Supreme Court decision relegates millions of undocumented Americans to the shadows of our economy and society, leaving them to remain living and working in fear of deportation," said Cuomo, adding "When President Obama acted in the face of Congressional gridlock to begin fixing a broken immigration system, his executive order was a sensible and important step toward long-overdue reform. Today's deadlock was a devastating step backward." 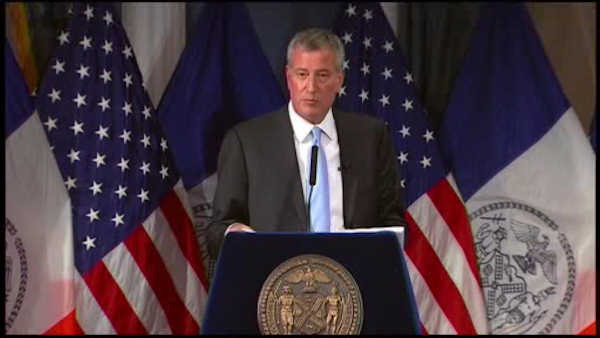 De Blasio said he is 'extraordinarily disappointed' in the court's decision. "New York City, like so many cities across the country, is stronger when all of our residents are secure in their ability to provide for their families and contribute to their community," said the mayor. "That's why, with over 100 of my fellow mayors and county leaders, I have supported the President's common sense efforts to help immigrants." De Blasio added that the decision underscores the need for federal immigration reform, and said he would continue to push for changes through Cities for Action. He said about 220,000 New Yorkers would have benefited had Obama's plan been affirmed by the Supreme Court. The 4-4 tie vote sets no national precedent but leaves in place the ruling by a lower court. The justices issued a one-sentence opinion, with no further comment.